The Windows Server 2003 Active Directory and Network Infrastructure Design course from ATS prepares you with the knowledge and skills needed to design a Windows Server 2003 Active Directory and network infrastructure. Expert instructor Michael Storm demonstrates how to create conceptual, logical, and physical designs for Active Directory and network services. 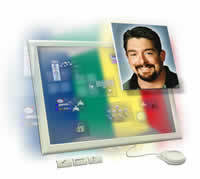 ATS prep courses for Microsoft certification exams meet or exceed all exam objectives. At the conclusion of the course, you will be prepared to pass the MCP exam Designing a Microsoft Windows Server 2003 Active Directory and Network Infrastructure.